Locking your Computer Prevents Malicious Activity… for PC, Mac and Chromebook Devices. Why? It prevents others from gaining access to your computer, files, student information, emails and performing malicious activities on your NMC Device(s). Know what Spear Phishing is: Spear Phishing is an email targeted at a specific individual or department within an organization that appears to be from a trusted source. It’s actually cybercriminals attempting to steal confidential information. Spear phishers are after more valuable data like confidential information, business secrets, and things of that nature. That is why a more targeted approach is required; they find out who has the information they seek and go after that particular person. 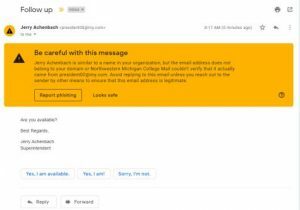 Spear Phishing has been a reality at NMC lately. We have seen suspicious links, .pdf documents, and purchase requests. To stay clear of these spear phishers, ALWAYS check the links in your emails! 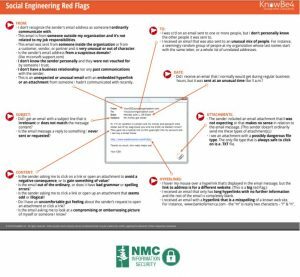 In addition, take the time to Read and Print this Red Flags Document to reference so you know what else to look out for in ALL Emails to make sure they are legit! Here is an infographic highlighting the differences between phishing and spear phishing. We have recently been the recipients of a number of Spearphishing Email attacks. We know everyone has been through the KnowBe4 training, and we appreciate everyone’s awareness of this recent attack. We wanted to send out an email with a couple of hints to keep you safe during this and future attacks. Most of the recent emails have had a Director (like Jerry Achenbach or Alex Bloye) ask you “Are you Available” or “would you purchase (Amazon or iTunes or other) Gift Cards…” These are Spearphishing emails, which can be sent to Spam or Phishing, trying to get you to react and click so they can start to gather your information and money. Please do not fall for this! 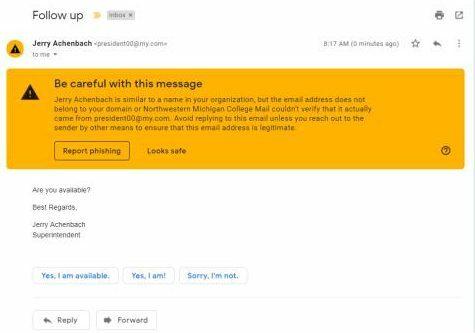 Many of you have received these Spearphishing emails and, if Google is doing its job, it put a banner at the top of your email warning “be careful with this message”. Google wants you to make sure this is a safe email. If you ever see this banner, ask yourself if the email you are viewing is real or if this is possibly phishing. If you have any doubt, do not click, just call the person or send them a separate email asking if this was them. Or, if you recognize it as phishing, you can Report Phishing right on the yellow banner. This is an example of what the Google warning banner looks like (see right). 3. In addition, please visit the Internet Safety Links in the NMC Technology Help Desk Knowledgebase under MyNMC for a curated list of links to review about Identifying/Avoiding Suspicious Emails and Gift Card scams. 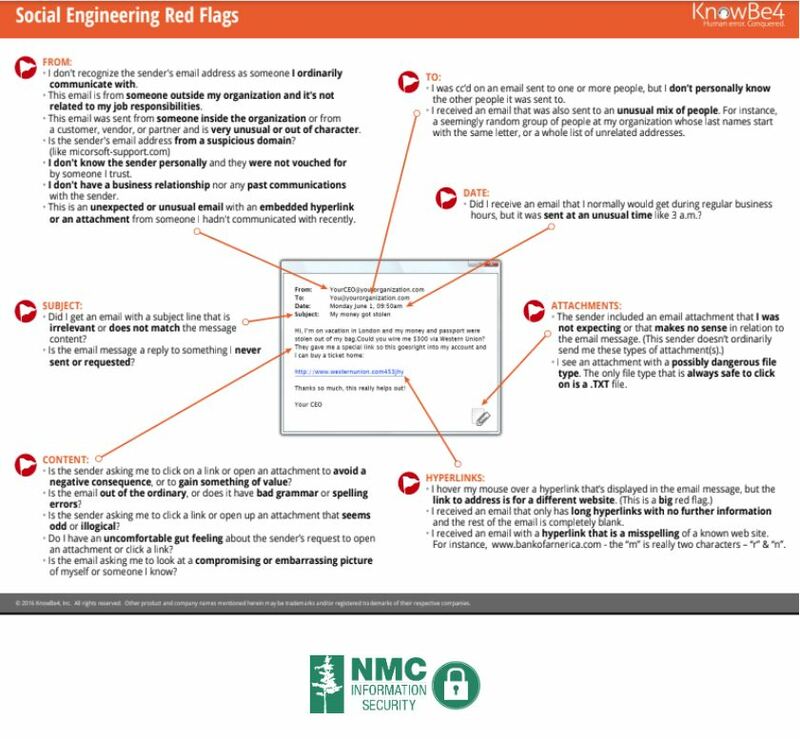 Also, included in the Knowledgebase page is the KnowBe4 Red Flag document. Print out the KnowBe4 Document and keep it close to your desktop, so you can use it to determine if an email is valid or not. Thanks for being consistent in using the techniques you have learned to keep NMC safe. Hello Everyone – If you are a user of Technology Help Desk, please read on to understand some of the recent changes and additions to Request Types in the ticketing system. Banner and Other Administrative Software has a new Request Type for Parchment, which is our new Online Official Transcript Ordering Service. All Other Administrative Software (including Campus Logic, Document Management, Elevate, My Success, R25 and StarRez) access requests now include an option to either Grant Access or Remove Access. 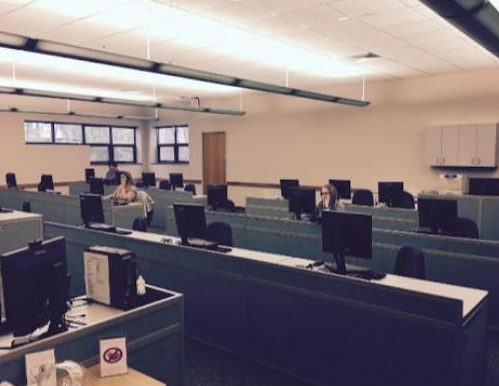 Banner and Other Administrative Software has a new Security Access offering for adding rights for Campus Logic the new financial aid processor that students use to enter information and upload documents used to verify their eligibility. Security Access has a new offering for removing Contractors and Partners called Contractor/Partner Computing Access Removal. Security Access has been re-organized into alphabetical order by sub-type. If you have any questions or requests regarding the ticketing system, please contact the Technology Help Desk at 995-3020 or visit nmc.edu/help for more ways to contact us. Access – Multiple improvements (see here). You can now download Office 2019 at NMC rate of $14.99. Click here for more info and instructions on how to download. Please note: On campus we still use primarily Office 2016, Office 2019 is not utilized on campus at this time. Enter in your NMC email which ends with @nmc.edu, then click sign up. Once you have done that, check your NMC email to finish signing up. Click the link in the mail from Office 365. After clicking on the link in your mail, fill out the details which are requested and create a password. Now that you have made an account, this will always be associated with your Office 365. You will now be able to download Office 365 on up to 5 Windows PCs or Macs and on other mobile devices, including Android, iPad®, and Windows tablets. When you are on your non-NMC personal devices, just click on the Install button to download the installer. You will need to repeat the download and install process on each device on which you wish to install Office 365. Follow the directions under install Office on your PC or Mac with Office 365 for installation. 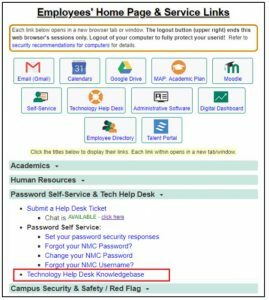 If you have any questions or need assistance, feel free to call the NMC Technology Help Desk at (231) 995-3020. Enter in your NMC email which ends with @mail.nmc.edu, then click sign up. Once you have done that, check your NMC email to finish signing up. Click the link in the mail from Office 365. After clicking on the link in your mail fill out the details which are requested and create a password. Now that you have made an account this will always be associated with your Office 365. You will now be able to download Office 365 on up to 5 Windows PCs or Macs and on other mobile devices, including Android, iPad®, and Windows tablets. When you are on your non-NMC personal devices just click on the Install button to download the installer. You will need to repeat the download and install process on each device on which you wish to install Office 365. At the end of the workday, shut down or restart your NMC computer. Whatever you do, we request that you DO NOT leave any machine logged in (not even locked). This affects security, updates and patches being applied, clearing of cache, computer refresh, and ensures your computer is ready to go the next time you work. Thank you for your assistance in this critical matter. Click here for all the instructions you need to know on how to utilize our Email-To-Print option. If you wish to see which printers are Email-To-Print enabled, click on the “Available Email-To-Print Printers” hyperlink in the middle of the page here. Tech Tips is presented by our Technology Help Desk and will provide you with simple explanations to tech troubles you may come upon in everyday technology use. These posts will occur regularly and will include a wide variety of topics. If you have further questions regarding the Tech Tips, please contact the Technology Help Desk at (231) 995-3020.